One of the best things to do in Ireland is to visit Joyce Country in County Galway. And no better way to get to know Joyce Country than to take in One of Joe Joyce's Working Sheepdog shows. 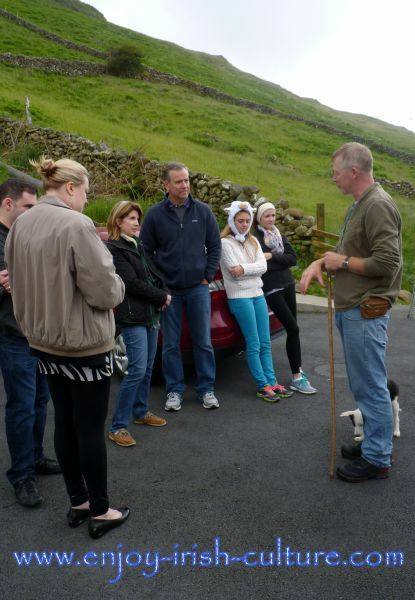 Sheep farming has long been part of Irish culture. Sheep farmer Joe Joyce at Finny, Connemara, Ireland, lives in one of the visually most stunning places you could imagine, on the shores of Lough Nafooey. Sheep are part of the landscape here. You will meet them on the roads, and see the hillsides speckled with them. The black headed Connemara sheep are particularly tough, bred to survive winter on the mountains. One of the best things to do in Ireland- experience the stunning landscape of Joyce Country and get a feel for how people live and survive here by attending one of these shows. The Working Sheep Dog shows are a lovely way to get to know and understand this landscape. Joe talks about the traditional ways of living and what is left of them, about the sheep, and he shows you how he works with his dogs. It’s lovely to see his close relationship and interaction with his animals. You get to pet sheep and when there are sheep to be sheared, you get to see that as well. There is an inside space for rainy days that hosts a gallery of photos of Joe alongside Hollywood celebrities such as Jennifer Aniston who came to visit him especially after working alongside him on 'Marley and Me' where Joe worked as dog trainer. 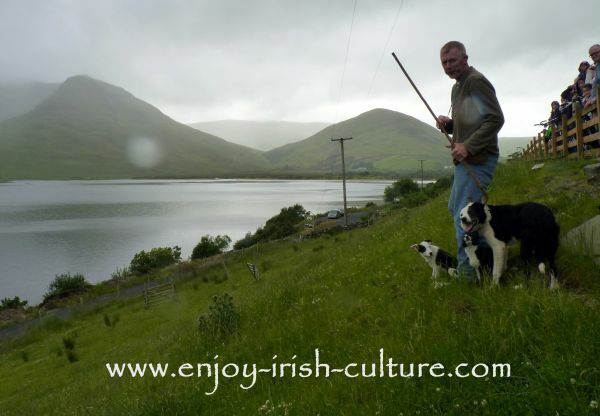 Things to do in Ireland- Working Sheepdog Shows in Joyce Country, Connemara, Ireland, led by Joe Joyce. Coming from Leenane, take the R336 signposted for Maam Cross. After 8 kilometres, turn left onto the R300 and continue on this road until you see the sign for Joe’s place on your left. Coming from Galway, follow signs for Headford. Go straight through the town of Headford heading for Cong. At Cross, turn left for Cong. In Cong, go through the village following the prescribed traffic flow, and when you reach the T junction at the bridge with the river on your left, turn left for Clonbur or An Fhairche. Follow signs for An Fhairche from now on, which is another 10 kilometres. At Clonbur, turn right at the T junction, then follow the main road for approximately 3 kilometres. The landscape is stunning here, so as well as enjoying it, don’t forget to look out for an inconspicuous turn to the right for Finny. You will see the first sign there for the sheep dog shows. Keep going on this road, it’s straight on all the way, through the village of Finny and continue beyond. You will see the sign for Joe’s place on your right. Joe’s Shows run daily between June 1st and September 30th at 3 p.m. daily from Monday through to Friday. 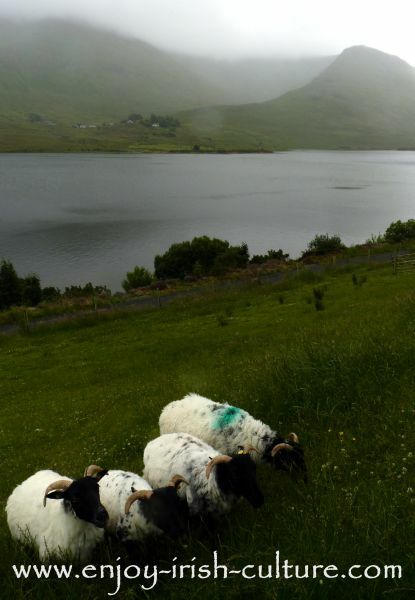 Sheep are used to keep the mountains of Connemara accessible. Sheep will eat anything, including heather and tough shrubs. Sheep stay on the mountains even during the winter. They are tough animals, but they do need care as well. They have to be brought down from the hills a few times a year, for example for shearing, for breeding, for dipping and for lambing. This is an awkward task for any sheep farmer who does not use dogs because the hillsides are steep and rugged. Joe however, as you will see during the show, accomplishes this task in no time by working with his dogs. There are a number of commands the dogs are trained to obey, both by voice and by whistle. These commands help the farmer to direct the dogs to gather and drive the sheep back to him. Joe demonstrates how quickly the dogs will work. How do you train the dogs, someone asked. Joe smiled and said, It’s all about praise. I praise them when they do well. How Does One Make A Living In These Parts? Well, not from sheep farming, when shearing a sheep costs 1.50 Euros, and you sell the fleece for 50 Cents if you are lucky! Sheep farming survives exclusively on EU subsidies based on the notion that sheep are needed to keep the vegetation under control on these hills. But it is by no means a profit making business. To make a living, Joe does a few different things. Along with his 200 odd sheep, sheep dogs have become his passion. He breeds and trains dogs. He sells two litters of pups every year which have become popular all over the world. And he does these exciting dog shows which are another source of income for the family. He has even had some famous visitors, including Jennifer Anniston, and he's got photos to prove it. One of the best things to do in Ireland for sure! We did this as an afternoon excursion from Galway, but it does involve a lot of driving. It is doable, but a whole day trip would be a more relaxed way to take in this special experience. The kids really enjoyed being around the sheep and dogs and they loved Joe’s friendly and fatherly presence. 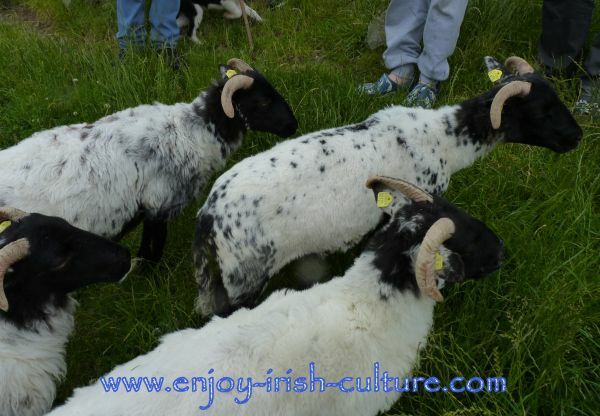 When you are looking for things to do in Connemara, Ireland, make a visit to the Sheep Dog Shows part of it. 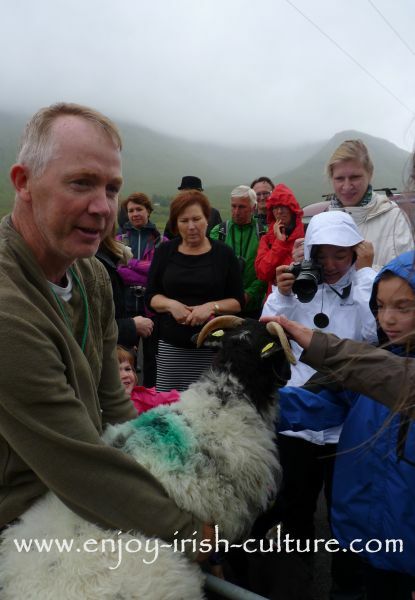 Taking in the other places to see here such as the village of Leenane, Renville beach, including the Sheep Wool Centre at Leenane, a visit to Kylemore Abbey, the Connemara National Park, or a crusie of Killary Harbour. If you are planning a day trip, pick one of these attractions to combine it with the dog show into a full day trip. 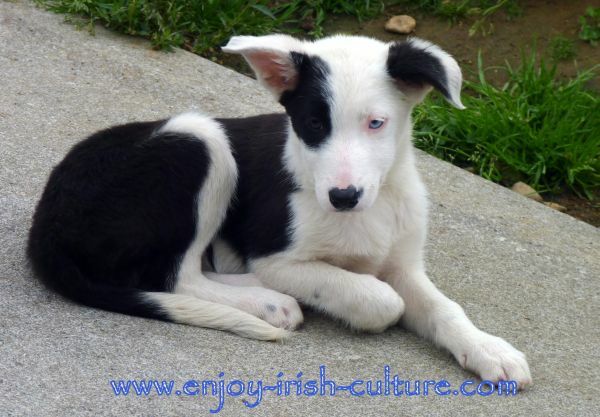 Hello there, hope you got a lot from this article suggesting things to do in Ireland- visiting a working sheepdog show in Connemara, Ireland. If you like what we do on Enjoy Irish Culture, please support us with a social shout out to all your friends. Simply use the handy social options at the top left and very bottom. Thanks so much and warmest regards from Ireland from Colm and Susanna. Return to the 'Ireland Vacations'.